Peoria, Arizona is a dynamic suburban community located just eleven miles west of Central Phoenix. 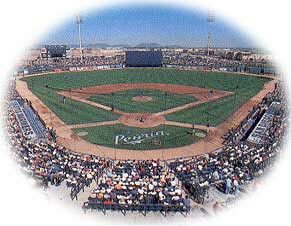 One of the fastest growing cities in Arizona, Peoria\'s featured Sports Complex is home to Major League Spring Training for the San Diego Padres and Seattle Mariners. Boasting a 10,000-seat stadium, the Peoria Sports Complex invites you to experience up close every stolen base, strike, and home run. In the fall the Sports Complex echos again the cheers and excitement of the Arizona Fall League baseball for the Peoria Javelinas and Sun Cities Solar Sox. You won\'t want to miss these top Major League prospects in action. January and February feature the Samsun Lions of Korea and Japan\'s Chiba Lotte Marines for their Spring Training activities. Peoria is all about baseball, but also offers an abundance of top-notch golf courses to challenge you! Or, retreat to the numerous fine-dining establishments appealing to all tastes and preferences. Looking for that unique item? Put on your walking shoes and delight your senses with the wide variety of shopping venues ready to cater to your needs. Peoria offers a delightful blend of open spaces, well-planned residential neighorhoods, parks, award-winning schools, a fantastic business climate and exciting recreational offerings. There\'s something for everyone from action and adventure to quiet relaxation and desert beauty. Welcome to Peoria\'s Pleasant Paradise.